BrickSwag is the #1 membership for LEGO fans. 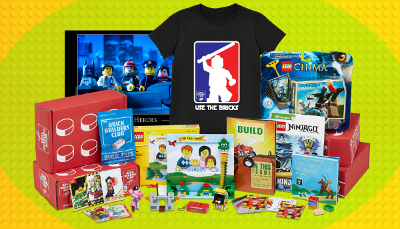 Each month includes official LEGO kits to build and keep, an exclusive t-shirt, Build magazine, Funky Fig trading cards, and more surprises. The mission of the box: To inspire, Educate and Entertain with LEGO bricks. Mail4Rosey readers will receive 20% off their Brick Swag Subscription with the promo code: FAM20. HURRY! Code expires 11/20/2015. OH yea, this is worth checking out! And yesterday I bought our great granddaughter Lego's. They are such fun. I remember my son and I building all kind so things back in the day. That's fun! Mica's all about Legos, Minecraft, and reading. Isaak's all about Legos, Minecraft and crafts. Oh my, my son would have loved this when he was in his LEGO phase. What a fun subscription! That is a brilliant idea. My boys are both obsessed with Legos! This sounds right up my kids alley! They are Lego fanatics, this would be perfect for them! Allison would have loved a girl version of this! She was all over Legos last year and that would have been an amazing gift that keeps giving all year long! OMG hubby would love this. He is such a big kid when it comes to Legos. Never heard of a LEGO subscription before. Sounds like a ton of fun! That is just so cool! If my son was just a bit older, I'd be getting this for him for sure! This is the first time I'm hearing of a Lego subscription service too. Fantastic idea! I was the Lego subscription for myself! Legos and Lego swag every month would be amazing! My son would have been all over it! Oh, this looks like something I wished I had when I was a kid. I love my Ipsy box, I would love this too. Do you think these boxes are appropriate for teens? My son loves Legos, but not sure if these boxes are appropriate for his age. Can you imagine the happy kids on Christmas morning that get a Lego subscription? WOW neat idea. I'm an adult and I want LEGO's in the house :) I think a monthly subscription is a great idea! I am going to take a peak at this...this would be a perfect gift for my son!